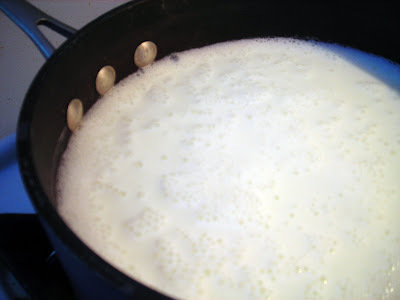 In a heavy saucepan, bring milk to a boil. Watch it carefully because once it starts to bubble and look frothy, it is almost at boiling. It will then to rise very quickly as it begins to boil, make sure it doesn't boil over. Remove from heat. 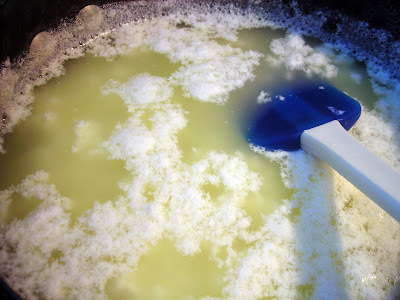 Add lemon juice and stir until curds start to separate from the whey, about 2-3 minutes. Cover and let sit 10-15 minutes until large curds form, then pour into a cheesecloth lined colander. When cool enough to handle, squeeze out any remaining liquid. 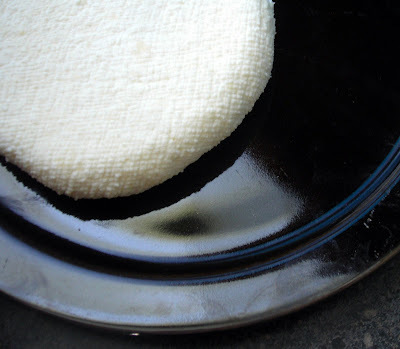 Place the cheesecloth covered paneer on a plate. Top with another plate and use the palm of you hand to flatten the cheese to 1/2 inch thick. Weigh the plate down with cans. Refrigerate overnight or eat immediately. 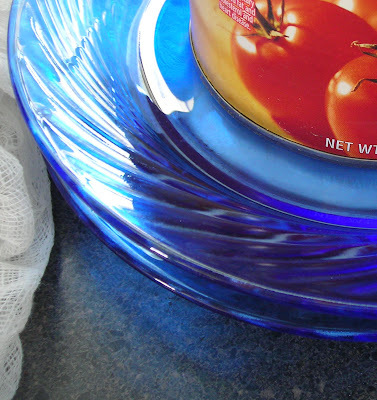 *Alternately, tie the ends of the cheesecloth together and hang on a hook over a bowl or on the faucet over the kitchen sink to drain, then press into a firm patty. This can take up to five hours. Paneer, a soft unaged cheese used in Indian cooking, is a great introduction to cheese making. It is fairly quick to do and as a bonus, doesn't require any extra equipment or special ingredients. It is most often made with cow's milk but it is not unheard of to make it with goat's milk or even buffalo milk. This recipe yields a modest amount of paneer-between 1 1/2-2 cups depending on how many curds form-but can easily be doubled. Paneer is great to cook with as it doesn't melt during the cooking process. If you've never had it, the closest thing in texture I can think of would be firm tofu, queso blanco or a young, firm goat cheese. The long it is pressed, the more solid it will become. My favorite ways to eat it include saag paneer, palak paneer and koftas. Note: While I called for whole milk, 2% can be used but I find the yield is sometimes less.